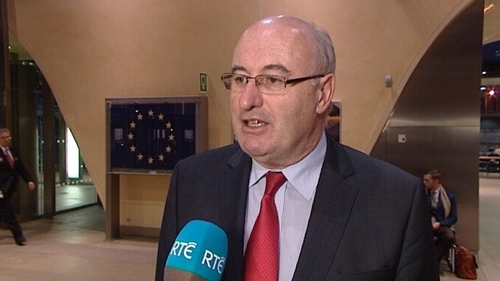 Ireland's EU Commissioner Phil Hogan has said he is still hopeful of a Brexit deal, but has warned that a UK-wide customs union with the EU would not be a replacement for this Northern Ireland-specific backstop. In an interview for RTE's Brexit Republic Podcast, he said a no-deal outcome would be chaotic for the UK. Mr Hogan said he was optimistic that a Withdrawal Agreement could be concluded between the European Union and UK in the coming weeks. However there were several caveats. He said the EU's chief negotiator, Michel Barnier, was looking at the idea of a UK-wide customs backstop with an "open mind" and would see what amendments are necessary to make it acceptable to the EU 27. The UK has been pushing for such an arrangement to be a replacement for the Northern Ireland-only backstop, as it would avoid any customs controls either on the island of Ireland or along the Irish Sea. However, Mr Hogan said a UK-wide arrangement could not be a replacement for the original backstop - it would only be complementary to it. He said the EU trusted that the backstop the British Prime Minister Theresa May had signed up to last December, and later in March, is what she would implement. Mr Hogan said the UK cannot be allowed to "cherry-pick" the single market and could not be out of the EU and still have the same benefits.